WASHINGTON — Chrysler Group was sued today by four rejected dealerships, which claim that they received unreasonable and unconscionable letters of intent after prevailing in arbitration. The lawsuit raises to nine the number of plaintiffs making such a claim against the automaker. The joint suit filed in U.S. District Court in Long Island, N.Y., objects to several Chrysler conditions for reinstatement, including one that would let the company withdraw its letter of intent if a nearby dealer protests the reinstatement within 30 days. The suit seeks reinstatement, compensation for lost income and punitive damages for Chrysler’s bad faith and/or reckless indifference for the dealers’ legal rights. Chrysler said today its letters of intent are legal. The company has complied fully with the letter and intent of the federal dealer arbitration statute, Chrysler spokesman Michael Palese said. The company has not been served with the latest suit, he said. The four dealerships that filed today’s suit are Eagle Auto Mall Corp., of Riverhead, N.Y., owned by Mark Calisi; Terry Chrysler-Jeep, of Burnt Hills, N.Y., owned by Charlie Morris; Crossroads Superstore, of Atoka, Okla., owned by Robert Sullins; and Westminster Dodge, of Dorchester, Mass., owned by Jim Bickford. All were shut down by Chrysler last year as part of its bankruptcy restructuring, then won their arbitrations with the company this spring. 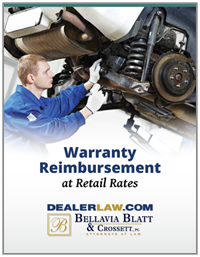 The lawyer for the dealerships, Leonard Bellavia, of Mineola, N.Y., said several other dealerships may join the suit in the next week or two. The federal law setting up the arbitration process required that Chrysler issue a customary and usual letter of intent to any dealer who prevailed in arbitration. At least 83 Chrysler dealerships have received letters of intent from the company during the arbitration process, but only 29 have signed them, Palese has said. Livonia Chrysler Jeep Inc., of Farmington Hills, Mich.; Star Chrysler-Jeep, of Glendale, Calif.; Causeway Jeep, of Manahawkin, N.J.; Deland Dodge, of Deland, Fla.; and Century Motor Corp., of Wentzville, Mo.